Our Cambodia adventure is a fantastically varied cycle odyssey. Cambodia's recent embittered history contrasts starkly with the grandeur of the Angkorian past. Our journey takes us the length of this unforgettable country to show you the cultural heritage and scenic highlights of Cambodia. Starting at a very sleepy Thai border that skirts the foothills of the Cardamon Mountains we ride deep into the Khmer heartland to explore rural Cambodia. Discover the fading colonial outpost of Battambang and journey by boat across the Tonle Sap (Great Lake), which is the beating heart of agricultural Cambodia. The highlight is, of course, riding amongst a thousand years of history at Angkor and we take three days to explore the extraordinary temple complexes before heading south. Enjoy the French colonial charms of Phnom Penh, before riding back into the countryside where we discover a people as beautiful and extraordinary as their land. Riding the quiet back roads south, we take time to stop and take in the great views that abound on the way to the old French colonial retreat of Kep. We spend the morning on Koh Tonsay (Rabbit Island), a wonderful tropical island just a short distance offshore. We also have a day to relax at the beach in Sihanoukville before a final day of cycling to Kirirom National Park. Depart from Bangkok, transfer to the Cambodian border, and then ride to Pailin, set in the attractive Chour Phnom Kravanh foothills. We ride through rural Cambodia along red dirt roads east to Battambang, a sleepy backwater full of charm and faded colonial buildings. If water levels permit, today's journey is by boat across the Tonle Sap towards the lost city of Angkor. We ride to the Angkor Temple complex before starting the Grand Circuit, stopping at each major temple area. At dusk, we return to the temples by car for a sunset view from Phnom Bakheng. We enter the temple complex by a much quieter gate and then ride into the countryside. We veer from the main tourist road to Banteay Srei, visiting Banteay Samre on the way. After a transfer to near Kampong Thom and the ancient temple site of Sambor Prey Kuk, we saddle up and ride between the temples. After lunch, we have a beautiful ride through paddy fields and small villages before a transfer to Phnom Penh. Early morning takes us to Koh Dach, an island in the middle of the Mekong, where villages live in elevated houses and weave silk fabrics. 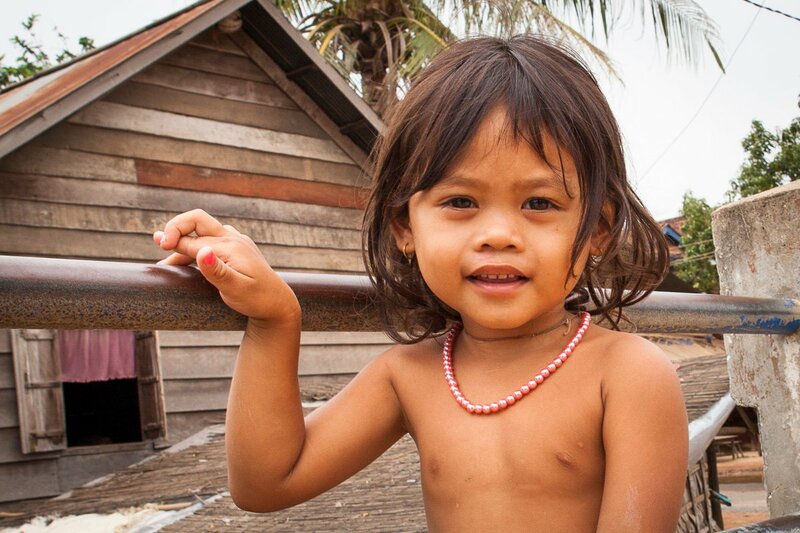 We start our long ride south into Cambodia's rural heartland. We ride on good roads with all manner of beast and other means of transportation, stopping at Tonle Bati, an Angkor period temple still in good repair. From Taeko, we ride along country back roads before eventually reach-ing the old French resort town of Kep on the Gulf of Thailand. Today is a semi rest day with an option to head over to Rabbit Island to see an unspoilt tropical paradise, relaxing before meeting up for a picnic lunch. In the afternoon, it's a short ride to Kampot. Riding along the coast in the shadow of Bokor mountain, we pass nu-merous fishing villages and ride through beautiful rural rice fields before heading south to the beach at Sihanounkville. Do as you will – chill out at the beach or take your bike to explore the town and countryside. We transfer to Kirirom National Park where we have quite a challenging 20-km ride to a waterfall and lunch. We transfer back to Phnom Penh where the tour concludes. Direct flights are available back to Bangkok. Day 1 - Bangkok – Pailin Ride 17km. +249m / -157m. A great way to see beautiful Cambodia and the country's amazing sights. Our guide Nak and driver Nan were the best. Their knowledge, helpfulness and good humour made the trip extra special. The food was excellent and plentiful. The only way to see Cambodia, Spice Roads staff are the best and most helpful. Excellent knowledge. We enjoyed a great variety of local foods, some upmarket, and some quite basic. The standard of roads travelled were as expected, some great, some potholed, muddy and rough. It was a great mix. Plenty of attention was paid to having enough water/food/regroup stops. We tended to stop around every 20k or one hour or so, which was just right. Big tick for - Chamrong's enthusiasm and bike knowledge, quality of accommodation, mix of cycling and sightseeing, riding on country backroads, having cold drinks and food at hand, great food. We ride a bit over 606 km mostly on a mixture of tarmac roads in reasonable repair and vehicle-width dirt trails. Most of the rides are on flat terrain, except Days 1 and 2 where the road does undulate, but nothing too difficult, through some very pretty and interesting countryside. Outside of Phnom Penh, traffic is light, and we often share the roads with ox carts and other cyclists. The trip is point-to-point and fully supported by an air-con minibus that will shadow us for the entire journey. This ride is mainly on quiet back roads, and we try to avoid the highways where possible. Getting out of Phnom Penh will require caution, and anyone who does not feel comfortable can opt for a ride on the support vehicle. Suitability: This trip has been designed to be easy with some undulations on Days 1 and 2, but nothing too difficult. This trip is possible for anyone with a reasonable fitness level. A support truck is always available to help when required. We depart from our meeting point in Bangkok and transfer down to Soi Dao, a very scenic area in Chantaburi province, that borders Cambodia. Very few foreigners visit this area, so the pace of life is slow and relaxed – just right for a bike trip. Once immigration and custom formalities are over, we cross into Cambodia and ride the 17 km to Pailin, in the attractive Chour Phnom Kravanh foothills. The ride has some undulating sections, nothing too difficult, and the views of the mountains make for a very pretty ride. Pailin is now home to former Khmer Rouge leaders and also famous for its ruby mines. We saddle up and ride east to Battambang. This is truly rural Cambodia, with lots of mango orchards, corn and peanut fields, and of course paddies. The ride itself has some great views as we ride along red dirt roads past the Cardamon Mountains, one of the wildest areas in Cambodia. We cross streams and really get a feeling of riding into unchartered territory. We have lunch at Wat Phnom Sampeau and visit the temple atop a limestone outcrop. Finally, we reach Battambang, Cambodia’s second city, a sleepy backwater full of charm and faded colonial buildings. This is a tough ride on an unpaved surface with lots of potholes, but we have full van support for anyone who does not wish to ride the whole way. Water levels permitting, today’s journey is by boat across Tonle Sap towards the lost city of Angkor. This great lake is the beating heart of Cambodia, and we cruise past floating villages and sunken forests before arriving in Siem Reap. We ride to the Angkor Temple complex before starting the Grand Circuit which includes Angkor Thom, the South Gate, the Bayon, Baphoun, the Terrace of the Elephants, and the Terrace of the Leper King. After a picnic lunch, we continue to cycle to Banteay Kdei, Ta Prohm, and Ta Keo, before heading back to Siem Reap. We stop at each major temple area, and you will have plenty of time to explore and take pictures as your temple guide informs you about this magnificent area’s history. At dusk, we return to the temples by car for a sunset view from Phnom Bakheng. Leaving Siem Reap by bike after breakfast, we enter the temple complex by an alternative route and much quieter gate. We then ride through the complex using some smaller roads. Once we leave the main complex, we enter the countryside and turn away from the main tourist road to Banteay Srei. We pass many local villages, schools, and people going about their day-to-day business, offering a genuine peak into local culture. On the way, we visit Banteay Samre, often missed but well worth a stop. This is one of the best rides on the tour. We stop at Banteay Srei for a well-earned rest before continuing to Kbal Spean (River of 1,000 Lingas), hiking to the top to view the riverbed carvings. After a picnic lunch, we transfer by bus back to Siem Reap. We start the day with a transfer to near Kampong Thom and the ancient temple site of Sambor Prey Kuk. We saddle up and ride between the tem-ples. This temple site, constructed in the 7th century, functioned as the capital of the Chenla Empire. It is one of the oldest temple sites in Cambodia, mostly covered in vegetation. After our 8-km route through the temples, we enjoy a picnic lunch prepared by the local community in small wooden huts along the Stung Sen River, absorbing local sights and sounds. After lunch, we have a beautiful ride through paddy fields and small villages with locals greeting you warmly. 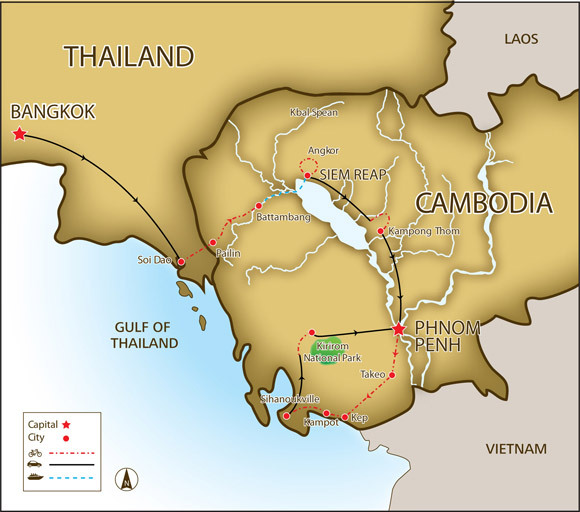 It is then a 2-hour transfer to Phnom Penh. This morning we go for a short ride to the island of Koh Dach, in the middle of the Mekong River. A local ferry takes us to there, where we ride dirt paths through the small communities and fruit orchards. Under elevated houses, we stop to see silk weavers create the supple fabric on their looms. We ride back to our hotel, and the afternoon and evening are free to explore town. We start our long ride south. Leaving the city behind, we ride along the mighty Mekong River and into Cambodia’s rural heartland. We ride on good roads with all manner of beast and other means of transportation. Lots of interaction with friendly Khmers makes this a fun day. We also stop at Tonle Bati, an Angkor period temple still in good repair and well worth a visit. Eventually, we arrive in the sleepy town of Takeo. After breakfast, we ride through the heart of rural Cambodia and see plenty of folk out in the fields tending their herds and rice paddies. These people are so friendly and outwardly happy that it is difficult to believe you are in a country that has suffered so much. It is the exuberance and humour of the rural Khmer that makes this country such a joy for bikers. Riding along country back roads, we eventually reach the old French resort of Kep on the Gulf of Thailand. Our resort, on a hill overlooking Kep, is the perfect spot to see splendid sunsets and is a perfect end to a great day of cycling. Today is a semi rest day! We can opt to head over to Rabbit Island to see an unspoilt tropical paradise (this depends on the weather, if the sea is too rough, an alternative activity will be offered). We have all morning to spend here exploring or just relaxing before a picnic lunch on the beach. In the afternoon, we ride a little way following the coast with some great views of Kep as we leave. This really is a beautiful ride along quiet roads and beautiful landscapes. We also have a chance to stop at the Phnom Chhnork on the way, a small but well-preserved temple inside a cave. Early start for today’s ride – one of the toughest, but best rides of the trip through fantastic scenery. Riding along the coast in the shadow of Bokor Mountain, we pass numerous fishing villages and ride through beautiful rural rice fields. After 60 km, we hit the main road and head south to the beach at Sihanounkville. Super fit riders might make the distance in time for lunch on the beach. Today is up to you: chill out at the beach in Sihanoukville or take the bike and explore the town and countryside. Lunch and dinner are your choice today. We transfer a short way (2 hours) to Kirirom National Park, where we have quite a challenging 20-km ride to a waterfall and lunch. We then ride back the same way to the resort in Kirirom National Park. We transfer back to Phnom Penh (2 hours). Tour concludes in Phnom Penh. You may choose to stay on or take one of the direct flights available to Bangkok. The bikes you will be riding are well-known mountain bikes with lightweight alloy frames, 24- to 27-speed gearing, v-brakes, and Shimano components and front suspension.